Triaging who gets seen first for evaluation typically is driven by both joint commission standards (we address OT consults within 24 hours of receipt) AND how fast it is predicted for clients to leave the hospital setting. More likely, clients will not stick around the hospital long; that is why we need to be strategic about HOW we triage evaluations. 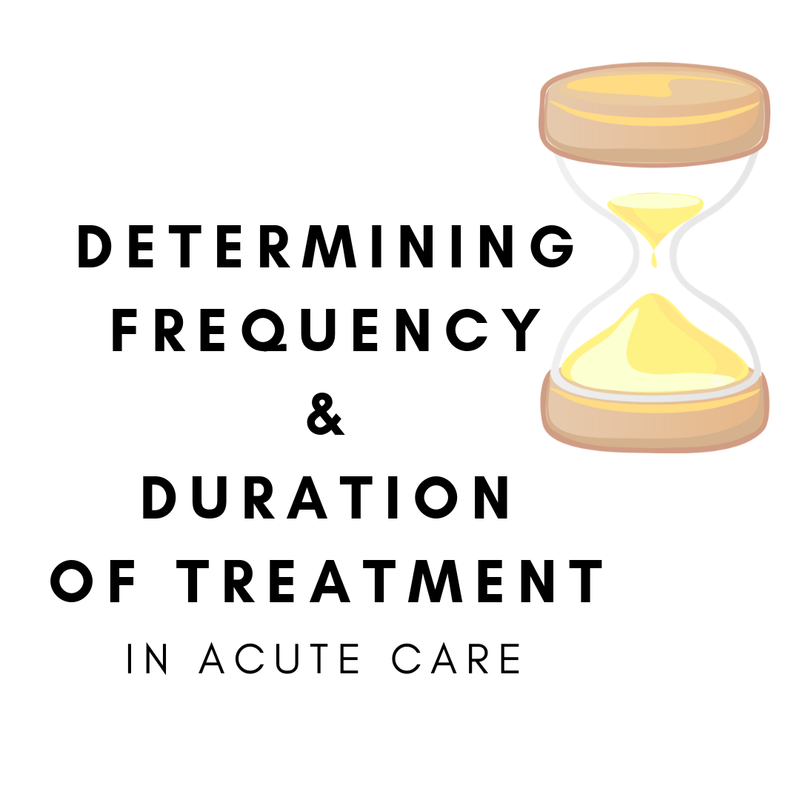 In acute care, we know evaluations are king…but what about frequency of treatment and the duration at which we should spend time with clients? All of these work alongside each other and not as one or the other. Each is a puzzle piece to a triage formula for determining who, how often and how fast. A: We do as OTPs as in any setting! As the OT practitioner, we determine duration and frequency based on the client’s skilled needs (not a supervisor, manager, director or caseload number). Do they have skilled needs? Determining whether we sign off at OT evaluation, select 5x/wk treatment, or choose 2 follow up sessions before the client discharge is influenced by skilled need. Whether clients stay 2 days or 2 months; what the client needs is what matters. That is why we indicate the true frequency needs. Even if the caseload is so slammed and you know you will not get to them for that 5x/wk for treatment, that treatment frequency represents what the client will require to recover in occupational performance when they leave us. Q: What are some cases where treatment may be minimal to no needs? 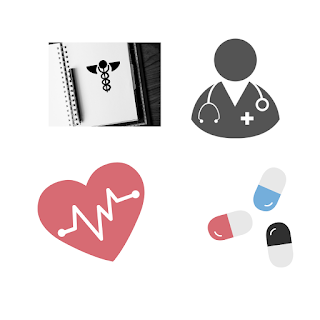 A: Client is going toward a comfort care approach (with no hospice measures indicated). When the client does not tolerate therapy for the duration we anticipate to see them that day. Or, we may be trialing our services for 2x/wk before determining a greater frequency because of poor tolerance for treatment or uncertainty in client ability to meet goals. There may also be times where we may sign off the client case completely when they do not have goals at all. Despite our attempts made over the course of their stay with us in acute care, we together (OT and client) cannot come up with any additional goals to progress occupational performance. 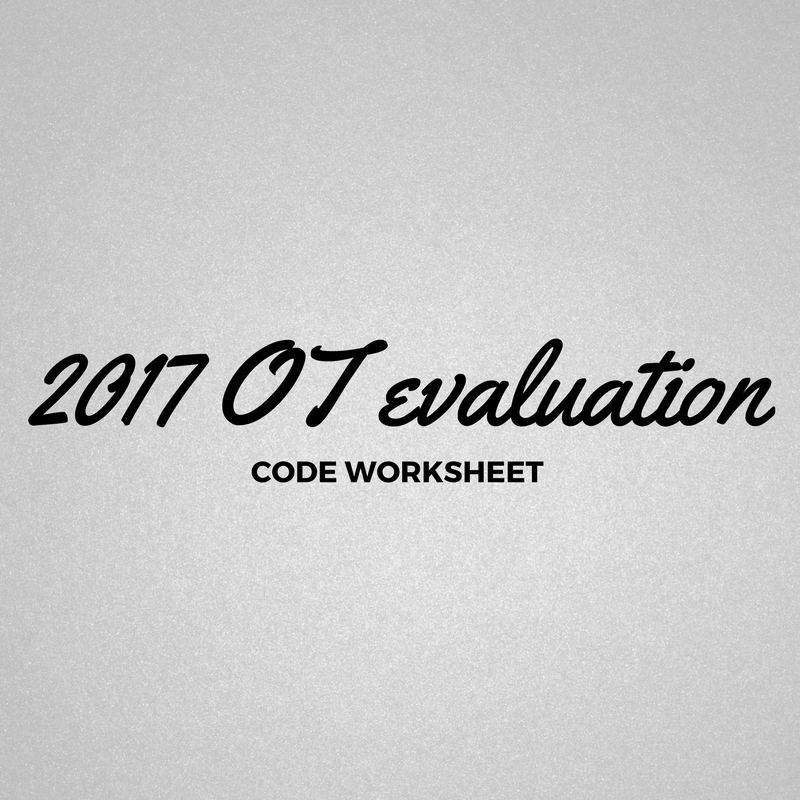 A: The evaluation complexity codes are chosen based on the clients number of occupational performance deficits, extent of occupational profile and overall complexity criteria. 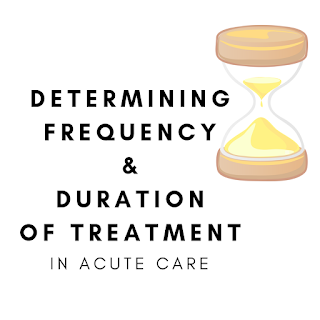 When it comes to determining treatment frequency however, code choice actually will play less of a role when the length of stay, discharge placement and readmission risk influence the circumstances. We may find a client only has a few things to be assessed for with more detail treatment to follow…or lots of things on evaluation to assess are found with less detailed treatment to follow. So many factors determining skilled needs. Truth is, it takes many years of practice to work alongside your client and determine skilled need frequency and duration of treatment (give yourself grace with this). Does the client have a caregiver? Does that caregiver have the time, availability and amount of assist level necessary for this client’s physical, cognitive, psychosocial needs at discharge setting? Will the client be returning to skilled service at prior discharge setting? No acute or infrequent acute needs until their return back. 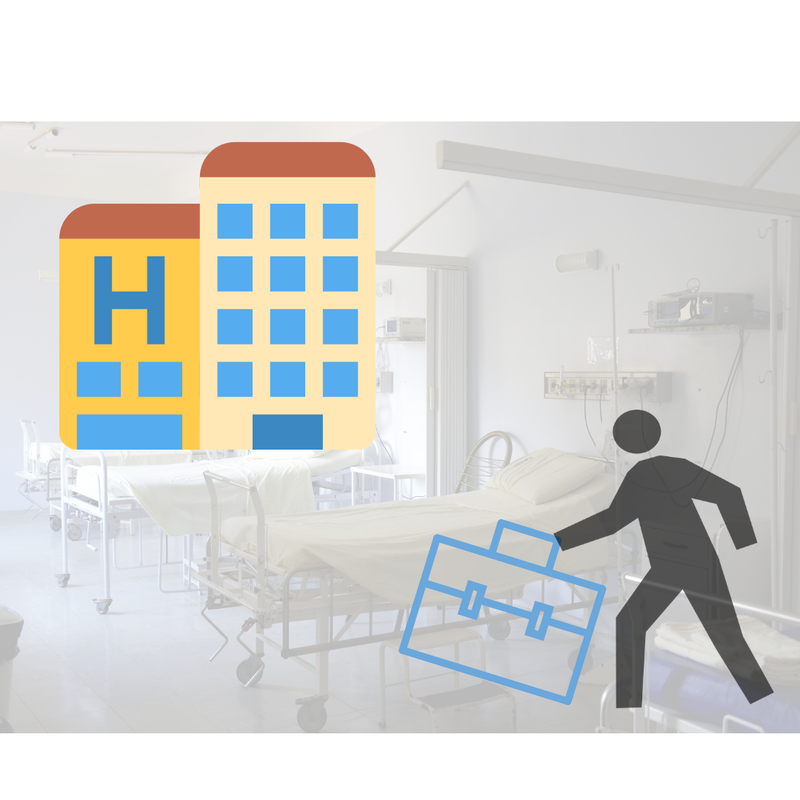 Example: coming from and going back to a skilled nursing facility. Does the client have a discharge setting to go to and will they be functional for that setting by the time they discharge? The client may be in limbo as to where they will go. When we do find out, we have to determine if they have enough caregiver assist there and whether they need OT when they go. 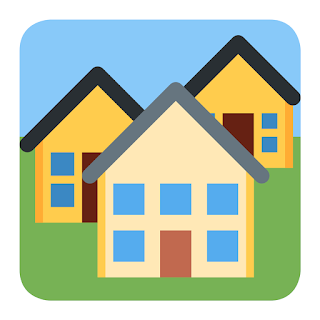 #1: Client will be going to an assisted living facility (ALF) but, they do not have 24 hour hands on assist (it is supervised level of assist). We find now after their hospital admission that this client needs physical assist to prevent a fall. We may be more involved in training the caregivers, or having increased contact with care coordination, to help facilitate their treatment needs going forward when they discharge the hospital. 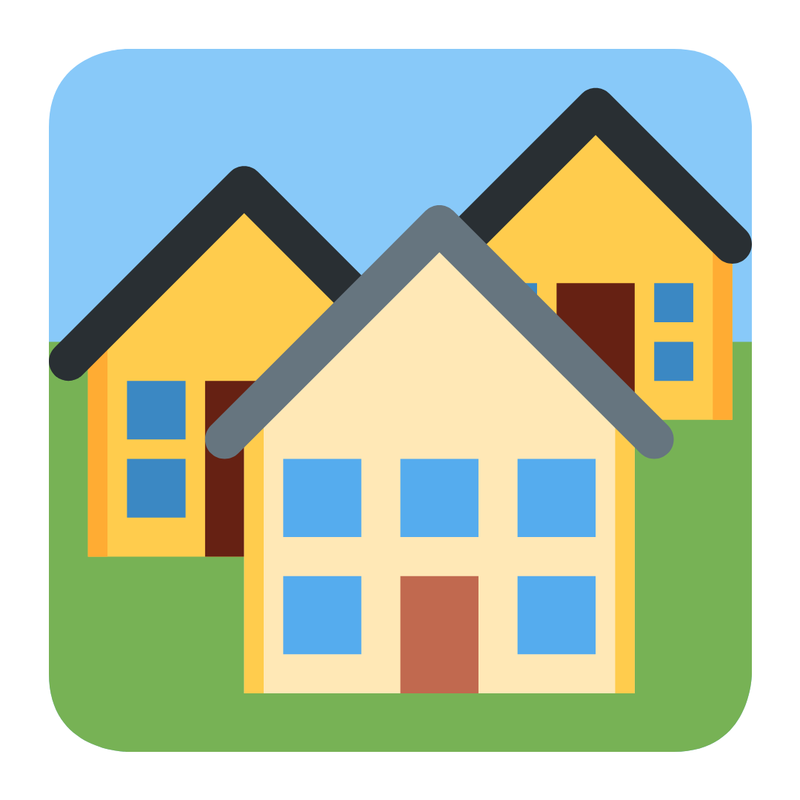 #2: Client is homeless and there is question as to whether they can discharge back to the streets with those multiple fractures they just sustained. It is uncertain if they can get home health OT at a shelter but, we would be prioritizing their treatments to maximize their skilled therapies while we have them in the hospital. We may need to download all we know into the client and caregiver’s brains to best prepare them for their functional well being with a new diagnosis if no OT service is accessible to the them. Client is medically ready to leave the hospital on post op day #1. They will not be getting home health OT services. Acute care OT needs to evaluate and provide treatment intervention all in the same day! Even though the client’s occupational performance is graded at a low complexity - 30 minute anticipated evaluation - we may be with them for a whole hour total to cover all the basics in treatment before the client discharges. This may require us to see them more often to justify tolerance for therapy and prove it to be beneficial in a critical rehab recovery time. If they do not have a set discharge plan in place after rehab, this may play a role as to whether the client is accepted to an acute rehab. Sometimes we have to play the role of being their acute rehab services (even though we function like an acute care setting) because the client has a critical functional recovery window (such as in an acute stroke or acute TBI. It may be time sensitive where the more frequently we can see the client, the better the functional outcomes. Q: What diagnosis may indicate more frequent or longer durations of treatment in acute care setting? A: a client who has sustained an acute neurological incident (TBI or stroke), cardio-pulmonary type surgeries, or clients who are on early mobilization protocol (ventilator weaning), may require prioritization for frequent treatments to maximize neuro, cardio-pulmonary and functional recovery. Benefit from greater frequency of OT services in acute care setting can also support discharge placement through our justification. Beyond functional recovery windows, seeing these clients more often proves their tolerance for therapy. To fulfill the skilled need to be accepted into that LTACH or acute rehab, we up the frequency of treatment to better the client’s chances in getting into settings recommend for them. Also, those diagnosis that are known for not receiving our services (for example a client on observation for a pelvic fracture), may benefit from our visits more frequently and for longer durations of time during their hospital stay. Q: What about diagnosis where the condition is terminal? 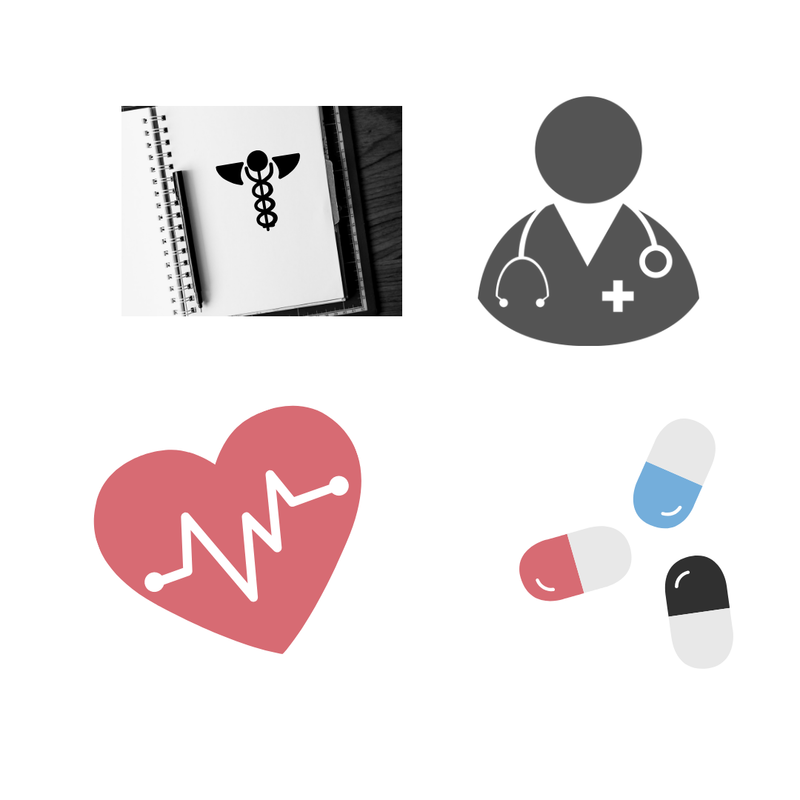 A: Some terminal diagnoses may have us determining less frequency for clients who are set for hospice or comfort care measures; this may lead to the client being signed off from OT services completely. We of course have a role in a client’s trajectory of palliative care, however, those needs can be best met at the next level of care/setting. Additionally, if we know what diagnoses are notoriously known for receiving OT services at the next setting, we may not prioritize them altogether and recommend they receive that upon their discharge. Knowing how long a client will stay in hospital will vary. However, it plays a critical role in determining frequency of treatment. This will help us prioritize treatment follow up. Is this client on an observation status, outpatient in a bed, or ambulatory status of care? Is this client someone who typically goes home after their medical scans are clear but likely to be predicted to have critical self care and functional retraining needs? While considering the discharge setting and follow up of OT services available to the client at the setting they leave us for, treatment duration may vary and more reliant on frequency need before they go. The shorter the stay in the hospital = the more frequent they will be seen for ADL retraining. The more frequent you need to see your client may also be a predictor in how long you stay for the duration of treatment on the first few sessions. When you know they will be going back to skilled nursing with skilled OT services (or back home to resume already-in-place home health therapies). Did I educate the family on the critical points for their loved one to be successful at the next level of care? Did I go over and have them return demo (if able) all the critical points I can think of that may be impacted by their current diagnosis and acute stages of recovery? Who is at risk for readmission? 1. Clients with acute on chronic conditions. Example: client with acute on chronic Congestive Heart Failure (CHF) admitted to the hospital due to fluid overload. The physician will take the fluid off of their body with medical treatment and send them home once medically stable. 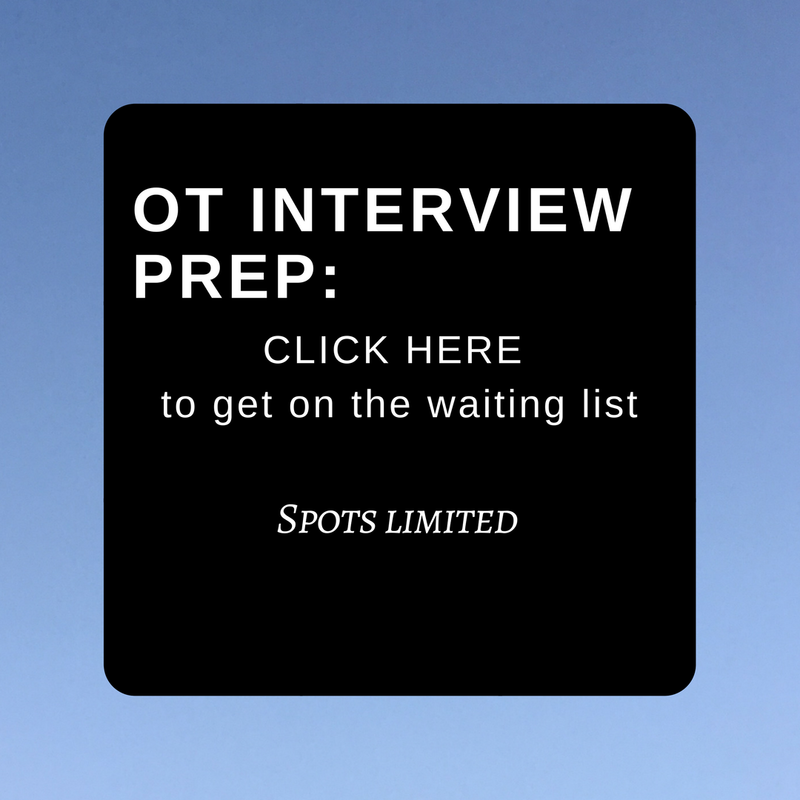 These clients may be back sooner than later if their symptoms are a result of client behavior, perception of medical treatment being a disruption to their daily occupations or other circumstances we find out in OT evaluation. We as occupational therapy practitioners get to figure that out and decrease their risk of being readmitted. That is why our interventions with them on day one will be so critical. Sometimes our treatment are the resources we provide to them that are available to the client in the community. With these cases, I sometimes find myself in unknown and uncharted territories as an acute care therapist. This is because their readmission risk factors are more dynamic than one diagnosis need; think of it like PEOP model on steroids (the environment influences the person and the person influences the environment. Both influence their performance and the occupation. Also, the place at which they occupy space is influenced and interchangeable). In our own implicit biases or uncertainties of how to assist these clients, we tend to defer these cases for a variety of reasons. 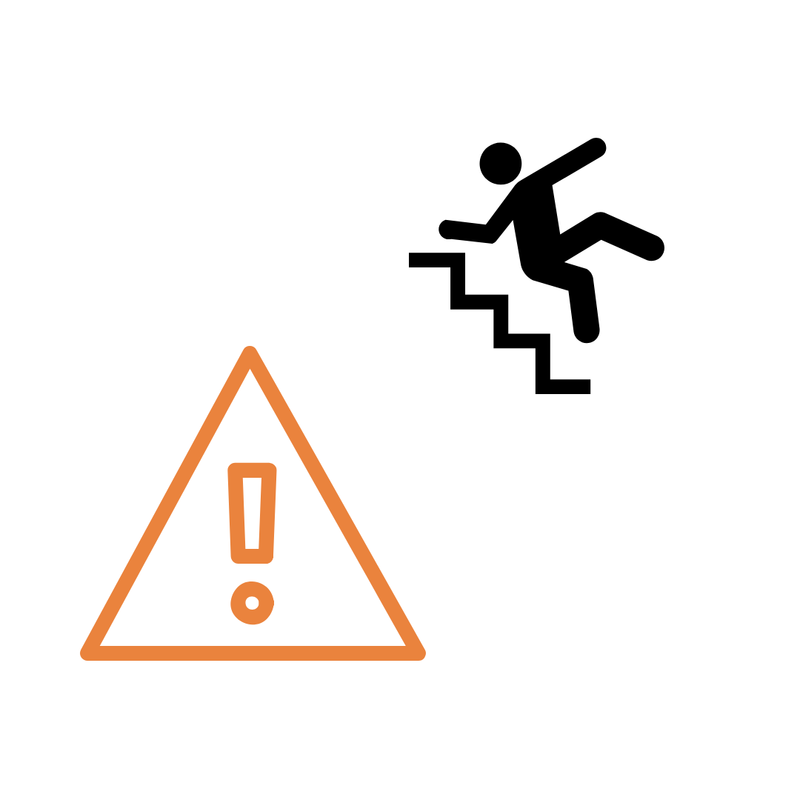 However, these clients are still at risk for readmission. So how do we play a role in their recovery to decrease their incidence of returning to the hospital? How frequent do we get involved in interdisciplinary care for these clients? When do we wean down our treatment frequencies? These clients tend to stick around the hospital for a while due to barriers in discharge; it is a question I ask myself regularly but know in my OT heart we have a role. I begin with an occupational therapy profile to get started on what treatments and interventions should be addressed. The interventions take time to build upon themselves to truly make an impact on clients with these chronic circumstances. That is because our interventions in acute care are not overnight fixes for this client population. We are used to treating with one to few sessions in this setting ( such as training the client on how to use of a sock aid for that posterior hip replacement). With complex medical cases however, there are many years of layers we need time to pull off to get to the client’s ability to perform self care well. When the client leaves and it is a question as to where they can receive those treatments and interventions elsewhere, what can we do in the short to help them with the long term outcomes? If you have ideas, I would love to know myself. Write them below in the comments.